Joe Biden: Window 'Has Closed' For A White House Bid : It's All Politics After a long and very public flirtation with a third White House bid, the vice president has ultimately decided against a late entrance into the presidential race. 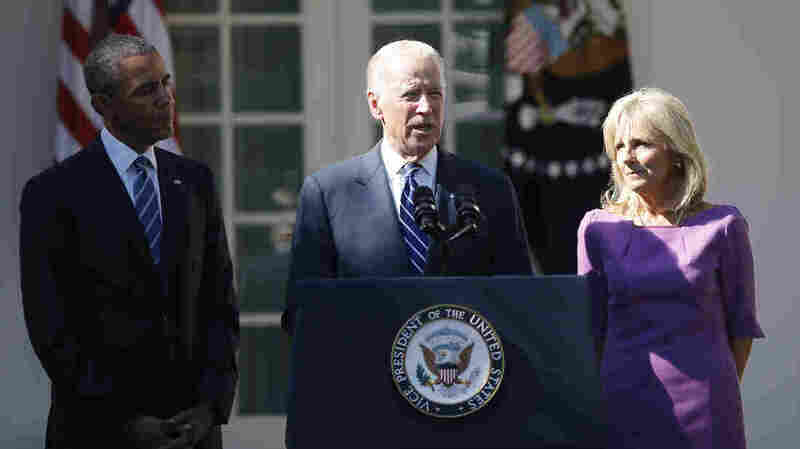 Vice President Joe Biden announces he will not seek the 2016 Democratic presidential nomination during an appearance in the White House Rose Garden with President Obama and Dr. Jill Biden. Vice President Joe Biden announced Wednesday he will not be a candidate for president in 2016, sparing Democrats from a shake-up in the race for the White House and removing a potential stumbling block for Hillary Clinton. The vice president's decision comes after a long, and very public, struggle with whether or not to make a third run for the White House. Overcome with grief after the death of his eldest son, Beau, in May from brain cancer, at many times Biden seemed far from ready for the rigors of the campaign trail. It was that mourning period that he referenced in a Wednesday afternoon Rose Garden press conference, flanked by his wife, Jill, and President Obama. "As my family and I have worked through the grieving process, I've said all along what I've said time and again to others, that it may very well be that the process by the time we get through it closes the window," Biden said. "I've concluded it has closed." Throughout the summer and into the fall, Biden was repeatedly pressured to run, and a superPAC supporting his bid started to gain traction. The drum beat for his entrance only grew as worries over Clinton, the once-solid frontrunner in the race, began to mount over questions about her private email server and concerns about her trustworthiness. But for Biden, the timing was not right, despite evidence showing he would have been competitive even with a late entrance into the race. The vice president had the highest favorably ratings of any candidate, and his frank and earnest demeanor combined with his blue-collar appeal would have made him an attractive candidate. That appeal was even on display in his announcement not to run, wearing the moniker of "middle class Joe" proudly. Delivering a campaign-style stump speech that likely would have been the cornerstone of a White House run, Biden vigorously defended Obama's tenure and sounded an optimistic note of how to move past gridlock in Washington. "I believe we have to end the divisive politics. It's mean spirited. It's petty," Biden said. "I don't think it's naive to talk to Republicans. I don't think we should look at Republicans as our enemy. They're the opposition, not our enemies." "Most of all, I believe there's unlimited possibilities for this country," the vice president continued. While Biden didn't issue an endorsement, he indicated he wouldn't be silent during the coming months. "I intend to speak out clearly and forcefully to influence as much as I can, where we are going to go as a party and as a nation," the vice president said. With his decision to pass, the race is now set with Clinton and Vermont Independent Sen. Bernie Sanders emerging as the top-tier in the Democratic primary. Clinton may still be facing questions about scandals involving her private email server and trying to show voters she is trustworthy, but now it's Sanders who is the chief rival to the once-solid frontrunner.